Thirty Mica2dot motes from Crossbow operating at 433MHz currently comprise the network. 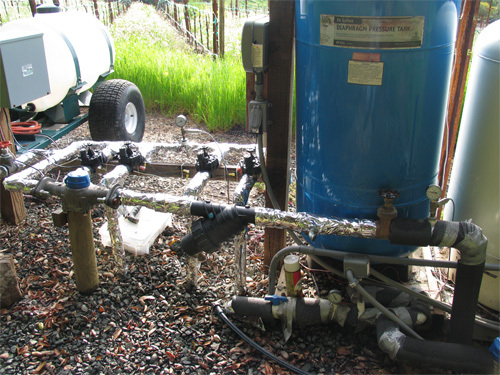 Mark Holler, owner of Camalie Vineyards, adapted the TinyOS firmware and developed interface circuitry for the specific soil moisture and water pressure sensors used in this system. He is also the grower who looks at the data and makes the irrigation decisions. Camalie Net was used during the 2005 growing season to guide irrigation decisions in the 4.4 acres of Camalie Vineyards. Yield per vine in 2005 was double that of the 2004 yields for same age vines yet water consumption was constant. Water consumption normally goes up with canopy size which more than doubled for these 2.5 year old vines in 2005. Grape quality was excellent. Some of this success was due to generally better than average weather and yields for everyone in 2005 but, we believe our visibility of the soil moisture played a significant role. 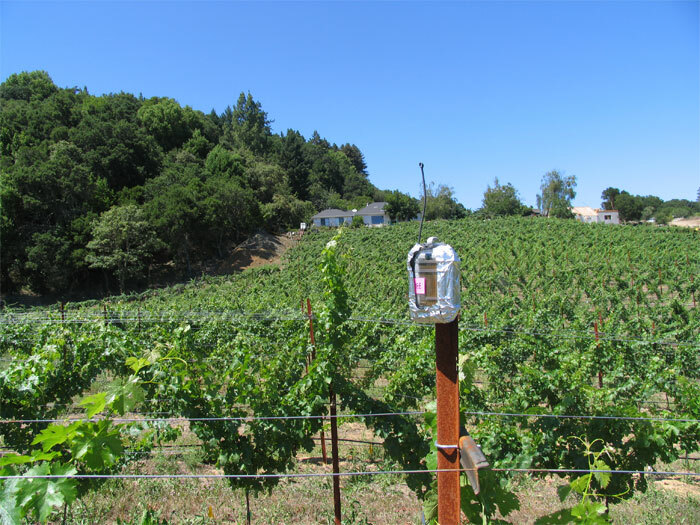 Extra drippers were added to some areas of the vineyard based on the soil moisture data. Also irrigation intervals were shortened based on sensor data to reduce the amount of water that penetrated below the root zones where it would be wasted. 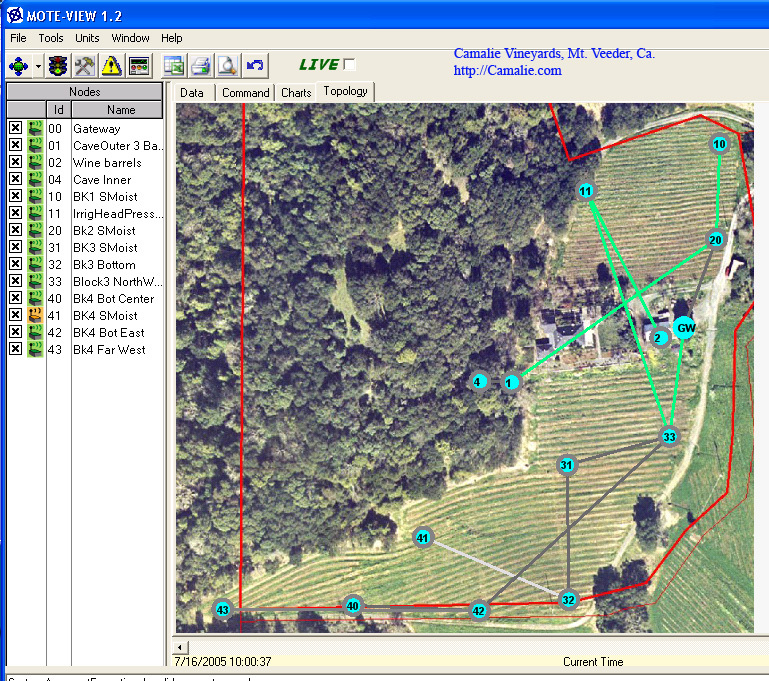 Below you can see an image of the vineyard with the sensor node connectivity map superimposed on it. This network map is updated in real time but is not accessible from a web browser yet. The motes send data once every 10 minutes. We currently use Microsoft's remote desktop to access the machine connected to the sensor network gateway in Napa. From Palo Alto we run Crossbow's Moteview in a remote desktop window to view the data. 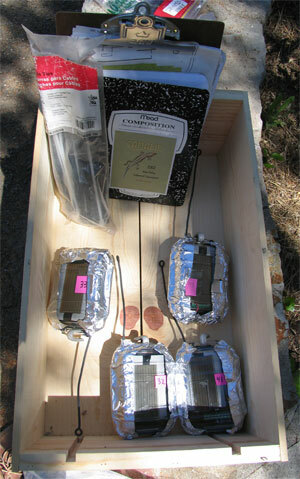 Five of the motes are each connected to a soil moisture sensor pair and a soil temperature sensor. These motes are distributed in the vineyard, one per irrigation block. The soil moistures are measured to monitor the irrigation water flow in the soils which is very useful data for scheduling irrigation events and identifying problems with the irrigation system. Nodes 1 and 4 are located in a cave, monitoring the temperature where wine will be stored. Node 2 is monitoring the utility structure where our 2005 Cabernet Sauvignon is currently stored. Node 11 is placed at the irrigation manifold and is connected to two pressure sensors which sense water pressure before and after the main filter. 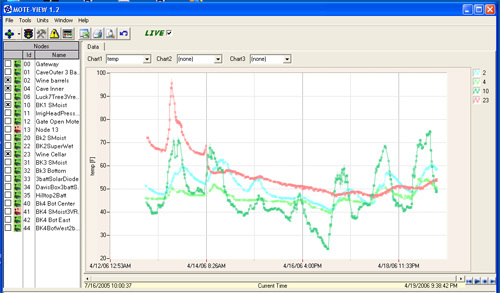 The pre-filter sensor has enough resolution to tell us the water level in the up hill storage tank. 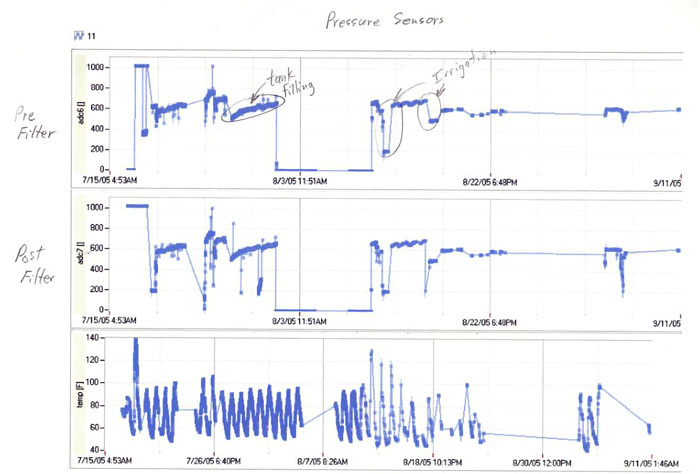 The pressure differential between the sensors during an irrigation cycle is a good indicator of the state of the filter and lets us know when it needs to be cleaned. Below is an irrigation block map of Camalie Vineyards showing the network topology active in the vineyard as of 7/13/05 superimposed on an exported image from our Manifold GIS system. Below is a plot of all the soil moisture data from the shallow five of 10 soil moisture sensors for the 2005 growing season. Lower values are wetter. The system was offline most of the winter. 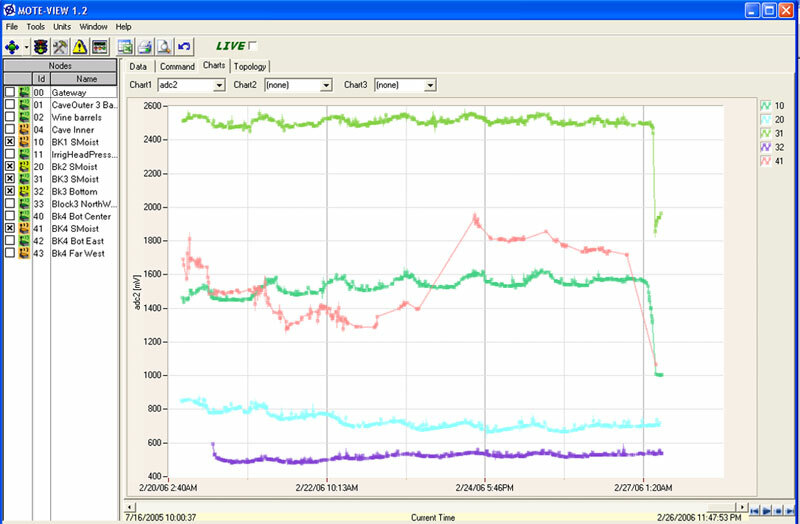 Below is a recent weeks data showing the soil wetting due to a rain storm on 2/27/06. 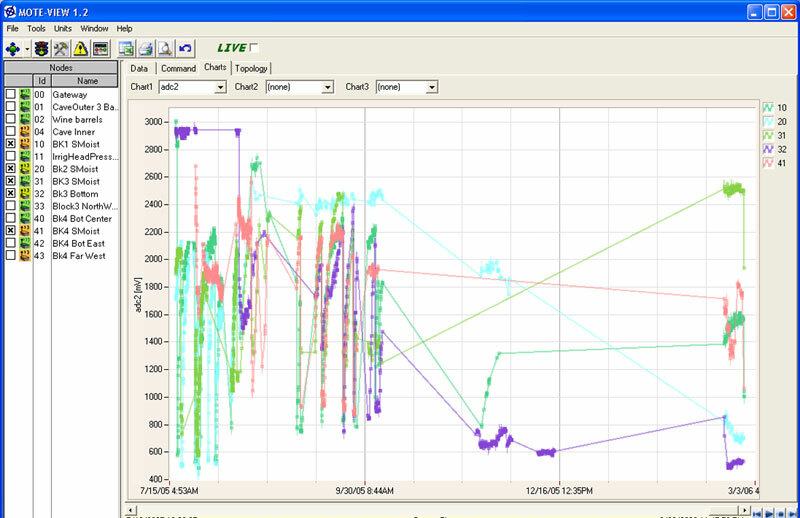 The jump up in the pink curve was due to a battery replacement. Below is a week worth of temps from across the vineyard and storage facilities. The green curve with the highest peaks is from a mote without a shroud to block sunlight from impinging on it. 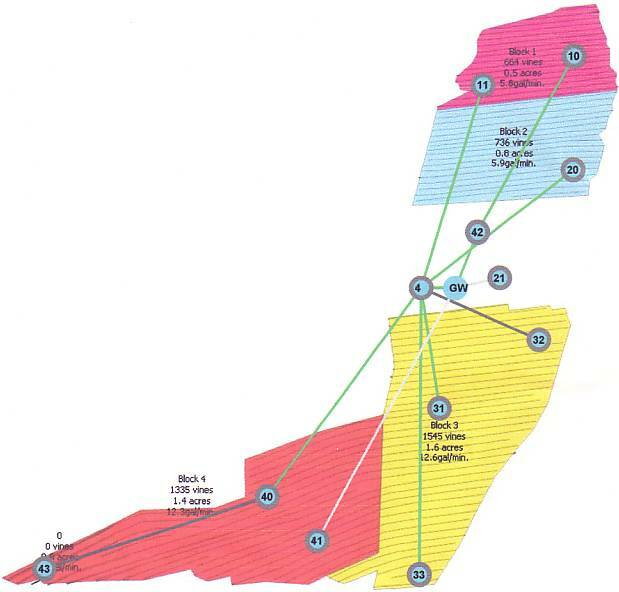 The turquoise curve is from inside the utility shed where the wine is currently stored. A nice even 50-60 degrees F for now. 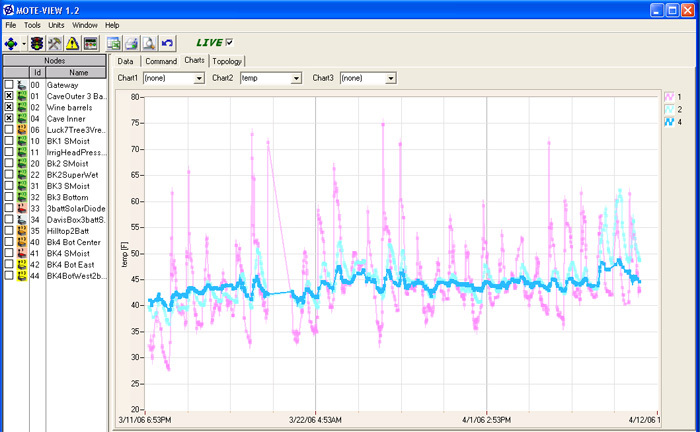 Below is a graph of the wine storage temps both cave and garage. Note the mote list of 21 motes all transmitting except for node 41 which has been taken offline due to a moisture related failure of the hardware. Here is a vineyard mote minus its aluminum foil shroud. It is a $10 Pelican 1010 waterproof box. Note also the hook at the top that enables this mote to be easily hung at the top of a line stake. 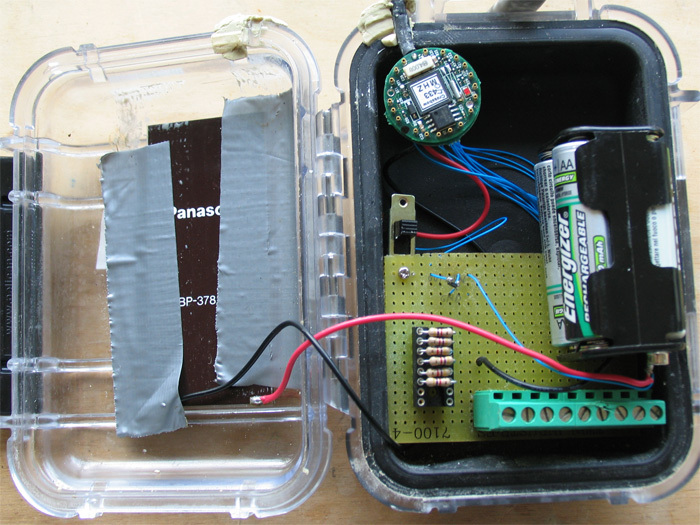 Here are the internals of Mote 40 showing the NiMH bateries, solar panel, 3V regulator, fixed resistors, sensor connection terminal strip and the Crossbow mica2dot mote. The antenna and feedthrough have been changed to a more reliable configuration since this photo. Four vineyard motes ready for placement in the vineyard. Note aluminum foil to reflect sunlight, keeping the internal temperature down and protecting the plastic from UV damage. It also seems to help improve the range. 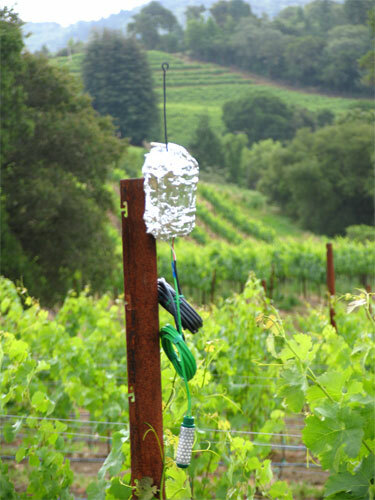 A vineyard mote on a line stake with soil moisture sensor (green) and soil temp sensor (black) dangling before they are planted in the soil. 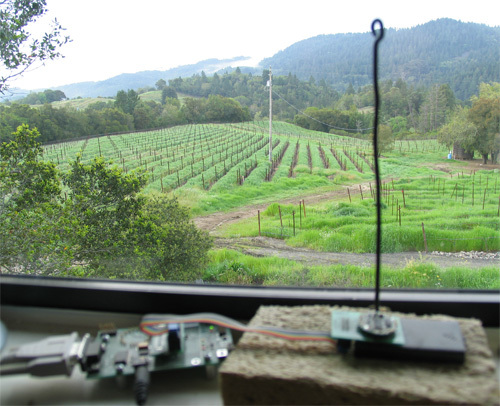 This is a picture of mote 32 in the vineyard showing the distance to the utility building on the right where the gateway node is connected to a computer with a satellite internet connection. From Inside the building. Nice view of the vineyard too. 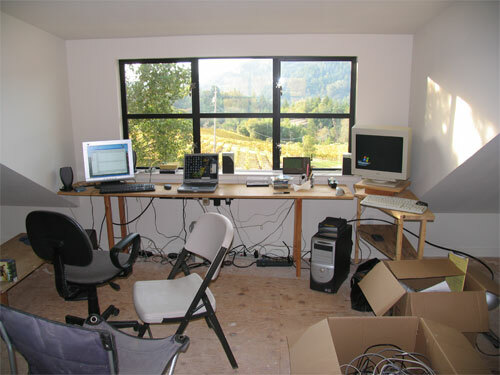 Here is the actual base station mote and MIB510 Serial Interface board in the garage window overlooking the vineyard. 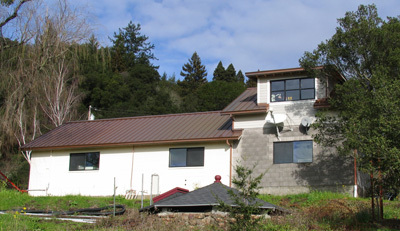 Half of the vineyard is behind this garage which has a copper roof. No problems with reception. 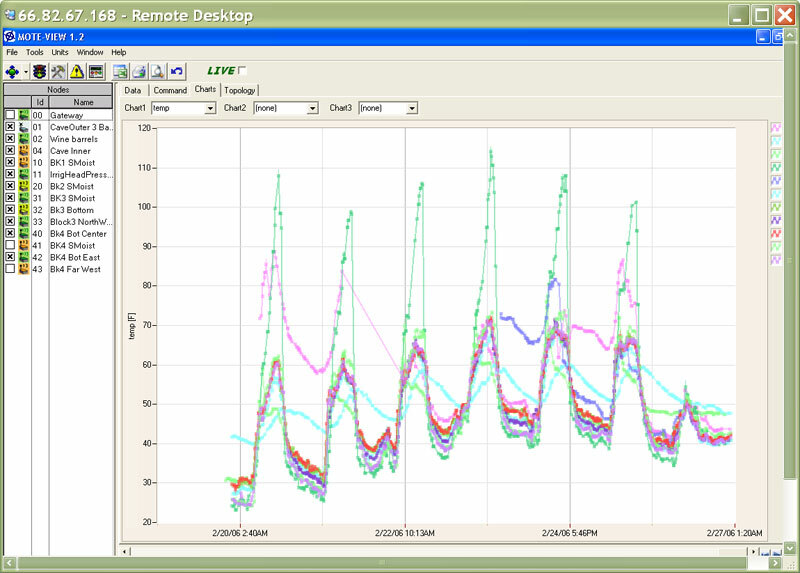 Six days of soil moisture data early on. The third trend plot labeled adc2 shows an irrigation event around 6/28; lower is wetter. The red curve is the shallow sensor, 12", green is deeper 24". Note delay in water getting to the deeper sensor as well as the dry out occurring later. 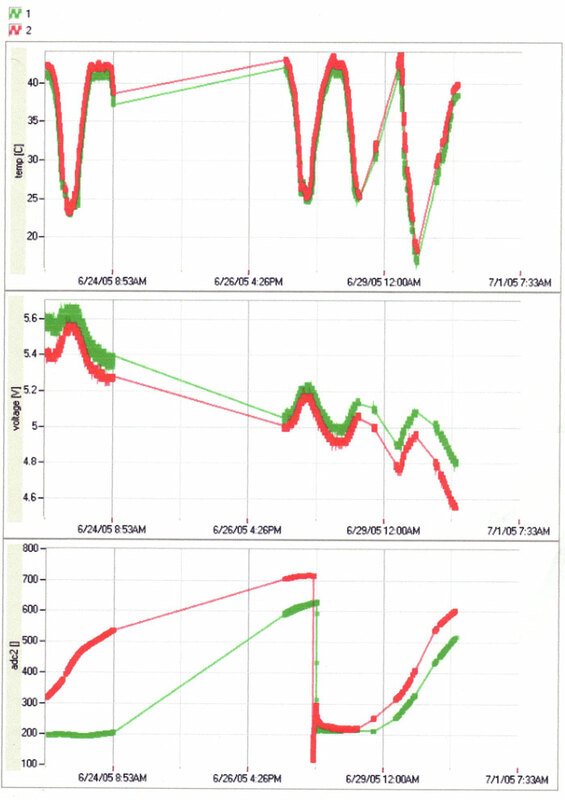 Below are plots of the pressures before and after the filter in the irrigation system. Below is a photo of the irrigation manifold showing the placement of the two pressure sensors relative to the filter. Mote 11 which transmits the pressure data is at the top of the stake you can see between the two tanks at the right. Temps outside the cave (node 1 purple), Inside the cave (node 4 dark blue), temp in garage where wine is currently stored (Node 2 light blue). Note lights turned on in cave the last two days and party held in garage that same weekend. Temperatures rose significantly.